Belugas are commonly known as white whales. The usual color of Belugas makes them one of the few most familiar and can be easily distinguished amongst other whale species. Calves are born gray or even brown and only fade to white as they become sexually mature around five years of age. White whales are quite small in size. They range from 13 feet to 20 feet (around 4 meters to 6.1 meters) in their length. White whales have little curve on the forehead and do not have a dorsal fin. Belugas normally live together within small groups, which are known as pods. White whales are social animals and are extremely vocal communicators and make diversified sounds using whistles, clangs, and clicks. 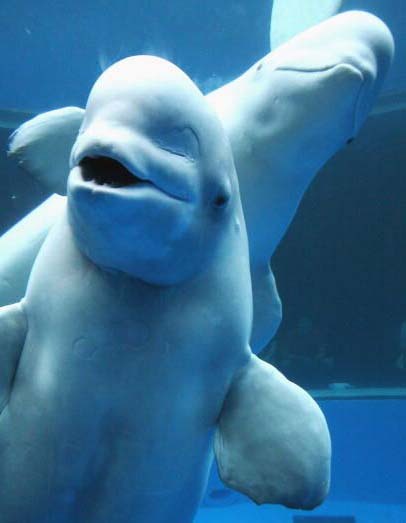 Belugas are also capable of mimicking several other sounds. These white whales are quite common in the coastal waters of the Arctic Ocean and are also found in the sub-arctic waters. These Arctic belugas travel southwards in their huge herds, when the sea-waters starts freezing. While traveling, these animals are trapped by Arctic ice and often die. These trapped often fall prey to polar bears and killer whales. The white whales are frequently hunted by the indigenous people, who are living in the northern region, and also by the commercial fisheries, which has made a considerable i,mpact on white whale numbers, for instance those living within the Gulf of St. Lawrence are close to extenction. White whale feed themselves on fishes, worms, and crustaceans. This whale is associated with the two-tusked “unicorn” whale, which is called narwhal. The white whale is by no means associated with the sturgeon of the same name, which has been greatly fished for its renowned caviar. Great information on Belugas..Nice elaborative pictures makes for a good read..I’ve never seen a Beluga but had read about during school but I really like your your article! !